Katyar Kaljaat Ghusali’ is a mesmerizingly crafted period film set on the backdrop of a princely state in Central India, during British Rule. Those days, every King had the privilege of having a classical singer to perform in his court. One such classical singer in the court of King Vishnuraj was Pandit Bhanushankar (Shankar Mahadevan), who has the distinction of being a reputed and respected singer for many years. This Pandit comes across a Urdu classical singer Aftab Hussian Bareliwale (Sachin Pilgaonkar) during his visit to Miraj. Being kind at heart, the Pandit invites him to his King’s state. He even offers shelter to the singer on his arrival. But, being very ambitious and selfish, Aftab Hussain tries to compete with Panditji. After a long wait, he finally succeeds in achieving the honor of ‘Khan Saheb’, the official singer at King’s court. 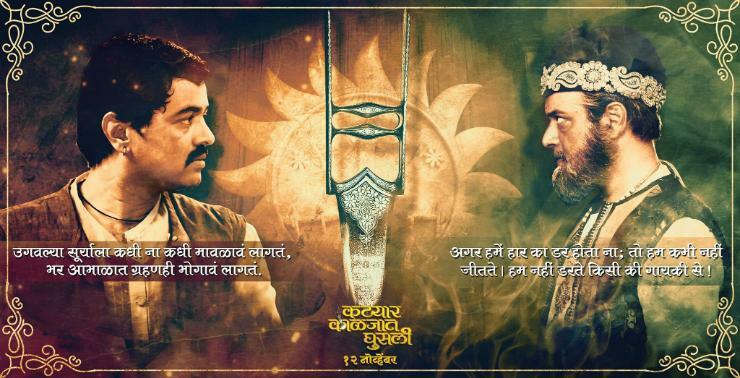 A few years later, we find Khan Saheb, facing the challenge from Panditji’s disciple (Subodh Bhave). The film has been presented in a grand way, and displays technical brilliance in each and every department. Besides fine performances coming from all lead artistes, the film has one of the most tremendous music scores in recent memory, conjured beautifully by Jitendra Abhisheki and Shankar Mahadevan. As this film is based on a famous Marathi classical drama of the same name, a few songs from the original version have been retained. This film is wholly based on Indian classical music and will definitely appeal to anyone who watches this movie. The director has put in immense efforts to bring forth the beauty of Indian classical music.Presentation of this film is so grand that one can compare this film, with films like ‘Mughal E Azam’, ‘Baiju Bawra’, and ‘Pakeezah’, based on Indian classical music. Performances by Shankar Mahadevan, Sachin Pilgaonkar, Subodh Bhave, Amruta Khanvilakr, Mrunmayee Deshpande, Pushkar Shrotri and few others are highly impressive. Overall, this is one blockbuster film that excels in the smallest of details. The fusion of Indian Classical music and terrific actors who do their roles justice makes it a film that you just cannot afford to miss!